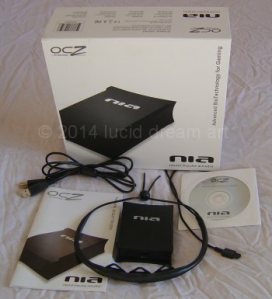 This makes use of the OCZ NIA (Neural Impulse Activator) advanced biotechnology games interface as an analogue to digital converter, by replacing the headband and just stuffing a small analogue signal in one of the inputs in relation to the reference (centre) connector pin. This contemplated my DIY motion sensor project where only the RX diode signal is used. Read more about OCZ NIA hack.